It’s a combination of Bingo and Roulette – what’s not to like? If you’re the type of player who is always looking for something fun, different and unique, then Spingo Roulette is the perfect game for you to try. 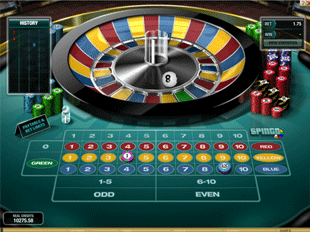 This sweet mixture of Bingo and Roulette will give you big payouts and an adrenaline rush on the side. Using a Bingo-style-draw machine to pull the Bingo Balls onto the Roulette-style Wheel, this game makes use of the elements that are essential to each game. Players have a choice of betting on individual numbers and colours or a combination of both. There are a variety of bets that can be placed. Players can choose to play with a particular strategy, or they can randomly pick numbers and colours and hope that luck is on their side. The table is laid out with the numbers 1-10 in the colours Red, Yellow and Blue, and the Green is the equivalent of the Zero in Roulette. Players can choose individual numbers or the numbers 1-5 or 6-10, Odds or Evens, Red, Yellow, Blue or Green or combine their favourites. A Score-Board is displayed on the left of the screen, which will show you a history of the latest games played and what numbers and colours came out as winners. Players can keep track of their results and use this in developing a winning strategy to ensure more winnings. Players who love a bit of style and have a great sense of humour are going to love this entertaining game. The 3D Roulette Wheel and the realistic ball movements will ensure that players feel as if they are playing in a brick-and-mortar casino.